Meniscus is the C-shaped two pieces of cartilage located between thighbone and shinbone that acts as shock absorber and cushions the joints. Meniscus distributes the body weight uniformly across the joint and avoids the pressure on any one part of the joint and development of arthritis. Being the weight bearing part, meniscus is prone to wear and tear and meniscal tear is one of the common knee injuries. Meniscal tear may be developed by people of all ages and is more common in patients over the age of 45 years with early osteoarthritis. Conservative treatments for meniscal tear include R.I.C.E (Rest, Ice, Compression, and Elevation) and use of non-steroidal anti-inflammatory medications. In older patients, corticosteroid injections may be helpful along with physical therapy. Surgery is recommended in almost all younger patients as well as older patients who fail conservative treatment and/or have mechanical symptoms. 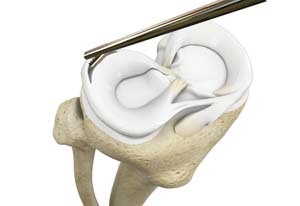 Surgery is performed using arthroscopic technique and typically only the torn or unstable portion is removed if the tear is deemed irreparable. The arthroscope is a small fibre-optic viewing instrument made up of a tiny lens, light source and video camera. The surgical instruments used in arthroscopic surgery are very small (only 3 or 4 mm in diameter), but appear much larger when viewed through an arthroscope. With the images from the arthroscope as a guide, Dr. Patel can look at the menisci and confirm the type, location, and extent of the tear. Once Dr. Patel locates the meniscal tear, surgical scissors and shavers can be inserted into the portals to remove the torn meniscus. In total meniscectomy entire meniscus is removed and in partial meniscectomy only the torn part of the tissue is removed leaving the intact tissue in place with edges smoothed.